This continuing education course features 83 exercises for free weights, machines, kettlebells, stability balls, and elastic bands plus 30 programs for developing endurance, speed, and strength in older, active adults. Wayne L. Westcott, PhD, CSCS, directs the exercise science program and fitness research program at Quincy College in Quincy, Massachusetts. 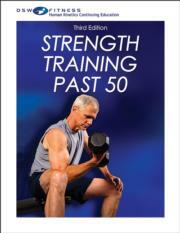 He has been a strength training advisor for several national organizations, including the American Council on Exercise, American Senior Fitness Association, YMCA of the USA, President’s Council on Physical Fitness and Sports, International Council on Active Aging, Medical Fitness Association, and United States Navy. He has also served as an editorial advisor for publications such as Physician and Sports Medicine, American College of Sports Medicine’s Health and Fitness Journal, American College of Sports Medicine’s Certified News, Fitness Management, On-Site Fitness, American Fitness Quarterly, Club Industry, Perspective, Prevention, Men’s Health, and Shape. Baechle has received numerous awards, including the Lifetime Achievement Award from the NSCA and the Excellence in Teaching Award from Creighton University. He has more than 35 years of experience competing in and coaching weightlifting and powerlifting and presenting and teaching on these topics. Baechle has authored, coauthored, or edited 15 books, including Fitness Weight Training, Weight Training: Steps to Success, and Essentials of Strength Training and Conditioning, all published by Human Kinetics.